Is Extinction the Attack on Titan game fans have been waiting for? It feels like the popular anime and manga franchise was specifically designed to inspire video games – it’s got action, tower defense, and massive bosses with implausibly specific weak spots – and yet we’ve yet to get that definitive AoT game. One or two decent ones, but nothing truly great. Extinction developer Iron Galaxy (Divekick, Killer Instinct) insist their game and Attack on Titan are “quite different,” but the influence is clear. 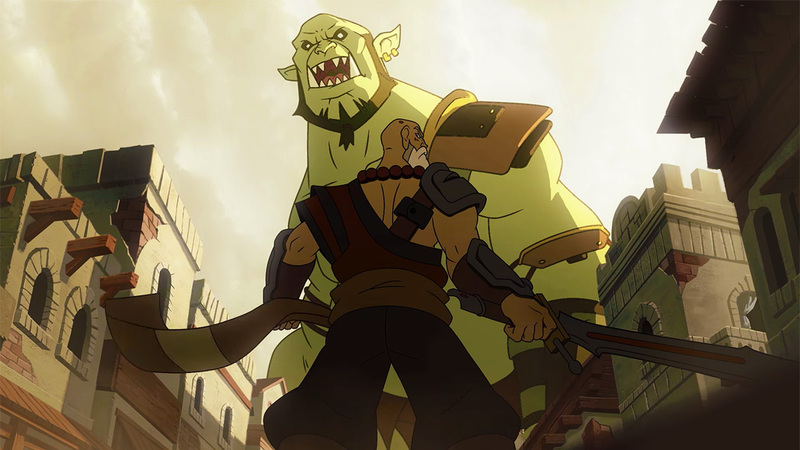 You play as a grappling-hook-wielding warrior who defends walled cities from giant monsters who happen to be vulnerable on the back of their necks. Come on. So, does Extinction do the giant-slaying thing right, or does the game deserve to be stomped out? Extinction takes place in fantasy world plagued by giant ogre-like creatures called the Ravenii, which are bent on destroying humanity. You play as Avil, one of the last representatives of the Sentinels, an order of soldiers who fought the Ravenii in times long past. Why isn’t every able-bodied person rushing to join the Sentinels now that the big green bastards are back? The game eventually serves up a reason, but the explanation is rather silly. 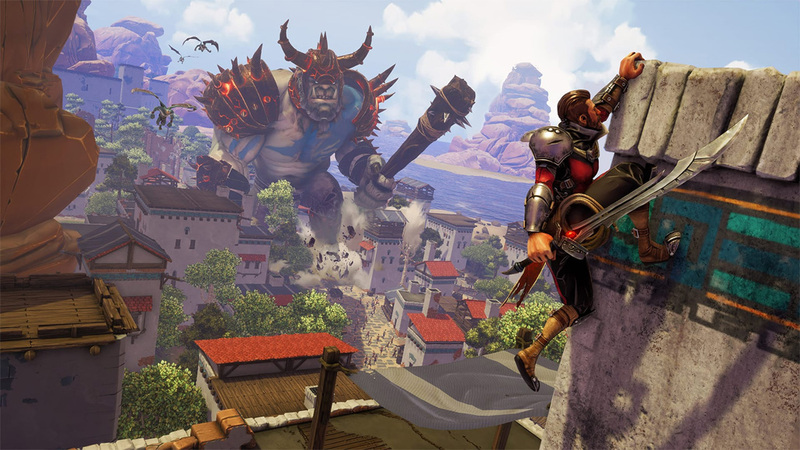 Extinction’s story is bog-standard fantasy fare, mostly told via dry text boxes. The game does boast a few nicely-animated cutscenes, but they mostly serve as a prelude to the main story and don’t have much bearing on any of the missions you’ll play through. Visually, Extinction is nothing special – it looks like a remastered PS2 game or a cheap mobile title that’s been ported to consoles. The towering Ravenii add some wow factor, but the framerate issues that crop up when you’re fighting them (particularly when the brutes are stomping through buildings) are less impressive. Audio-wise, the game’s soundtrack is very sparse, and the talking heads that pop up during missions to offer inane tips, warnings, and plot updates may drive you over the edge. Avil is an agile avatar, able to bound and grapple over rooftops, glide through the air, and effortlessly scale pretty much anything. Playing as fantasy Spider-Man can be fun, but the game rarely gives you a chance to just mess around. Missions are demanding and you’re almost always working against the clock in one way or another, which highlights how frustratingly imprecise Extinction’s controls are. Avil often gets caught on objects, bounces unpredictably off trees and awnings, and sometimes decides he just doesn’t want to climb a particular wall or sweaty Ravenii back. 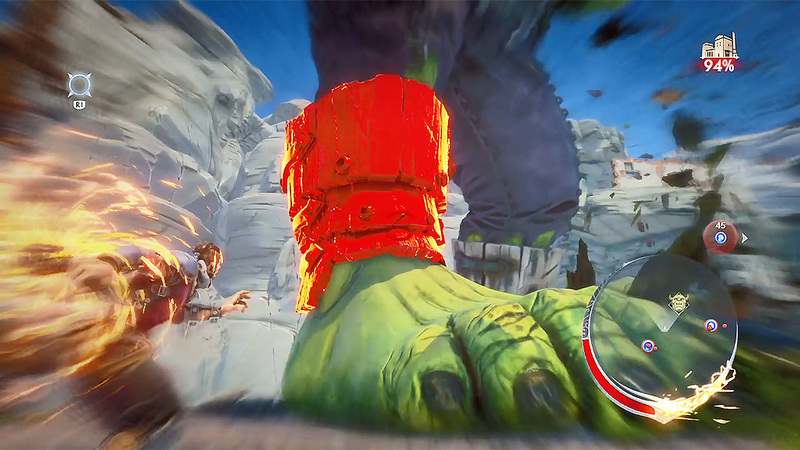 Extinction’s two-button combat makes it easy to pull off badass moves, but don’t expect a lot of depth. Alternate between quick and extended presses of the attack button to pull off combos and hit the dodge button when an enemy is gearing up for an attack. That’s all there is to it. The system feels mashy and I don’t think I ever died fighting the game’s regular-sized “Jackal” minions. With the exception of the annoying-as-hell flying enemies introduced later in the game, you can take down all the grunts by just spamming your favorite combo. Pretty disappointing for a developer known for their fighting games. 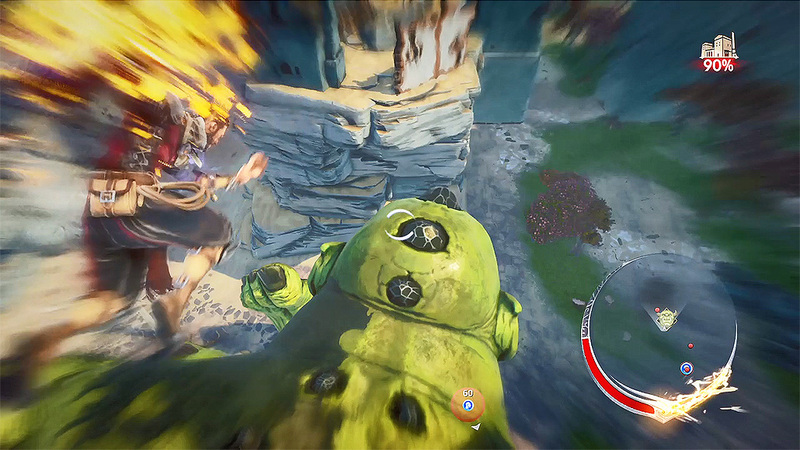 Extinction’s core gameplay loop is fairly straightforward. The only way to destroy a Ravenii is to decapitate it with a maxed-out Rune Strike, which you power up by killing Jackals and transporting civilians to safety using magic crystals scattered around the map. While you’re trying to power up your kill strike, the game tracks how much of the city is still standing – reach zero percent and you lose. It’s a fine system in theory but critically flawed in execution. Extinction lacks a full-scale map, and your radar’s range is limited, making it difficult to locate those citizen-saving crystals. Enemies also spawn randomly, so there’s no relying on them to fill your Rune Energy meter. There’s no way to plan or play efficiently — you just have to scramble and hope you stumble upon the needed enemies and crystals. Some of the harder missions pretty much require you to fail and retry multiple times, as rote memorization of crystal locations is the only way you’re going to make it through. Thankfully, there is a way to game the system a bit. It’s possible to slice through Ravenii armor and limbs without a powered-up Rune Strike (you only require one to deal the final blow). In fact, hacking off Ravenii armor and body parts is one of the quickest ways to build your Rune Energy. Also, Ravenii limbs regenerate, so often your best bet is to skip saving citizens and killing grunts, beeline towards the nearest Ravenii and amputate its leg at the knee. This will render the Ravenii immobile and unable to cause any damage, and when his leg regrows you just lop it off again. Repeat until you have a full Rune Energy meter and can put the poor dumb lug out of his misery. It’s clear the designers of Extinction would prefer you didn’t play this way, as the game only briefly mentions that destroying Ravenii armor/limbs builds your Rune Energy. 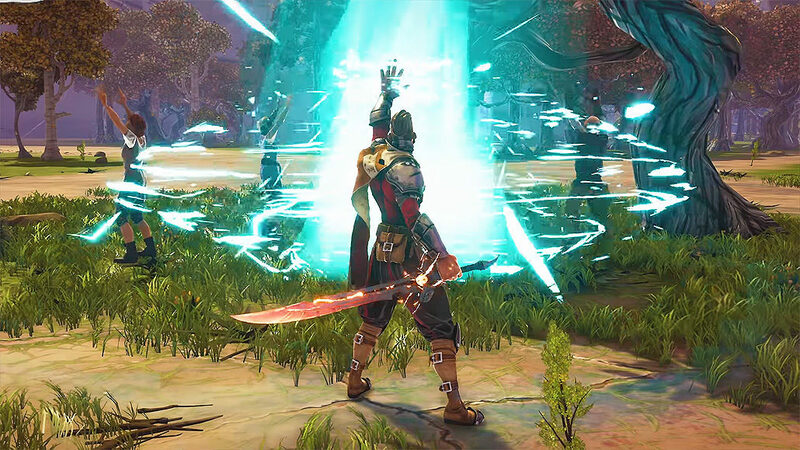 Later in the game, Extinction shuts down the knee-chopping exploit by giving some Ravenii indestructible leg armor and other new defenses, which just serves to make the game more frustrating. If you can’t cripple a Ravenii, you have to take it out while it’s still moving, which is no fun. Trying to hit hard-to-reach weak spots while a Ravenii flails around and crashes through buildings is a bit like trying to assemble Ikea furniture in a busy bouncy castle. Extinction’s level design is messy and haphazard, particularly when the game tasks you with doing something more complex than “kill the Ravenii and save the city.” The game’s exploratory platforming missions are exceptionally bad, although the dirt worst are the procedurally generated levels. Sorry, that’s the wrong term – randomly generated is more apt, as they’re just a jumble of arbitrarily-placed crap. These random missions make up about 30 to 40 percent of the campaign, and, depending on the placement of citizens and hazards and types of Ravenii you have to face, they’re either a cakewalk or nearly impossible. Given how sloppy the rest of Extinction is, it’s perhaps unsurprising that the game’s also glitchy as hell. I had the game crash at least three times, and more than once I fell inside Ravenii as I tried to climb them. And those are just the worst issues I encountered – getting stuck on stuff, wonky enemy behavior, and weird framerate stutters are common. Extinction’s campaign consists of seven chapters you could, conceivably, best in around seven or eight hours. It took me closer to 20, as the game’s difficulty curve is a mess and kept throwing brick walls in my path. I persevered through these challenging missions, because, well, it’s my job, but I have a feeling most players won’t have the patience. You can level up your character and may eventually master Extinction’s quirks to become an adept Ravenii killer, but once the frustration melts away, all you’re left with is tedium. The game’s side missions and Extinction and Skirmish modes just offer more of the same. Extinction peaks the first time you kill a Ravenii within its first 20 minutes, and it’s all downhill from there. Stick to the actual Attack on Titan games. This review was based on a PS4 copy of Extinction provided by publisher Modus Games. The game is available for purchase on Amazon. Extinction presents a handful of decent ideas, but they’re executed with all the precision and grace of Godzilla stomping through Tokyo. Buying this sloppy, ugly, derivative, repetitive, technically inept, and unfairly difficult monstrosity is guaranteed to leave your weekend in ruins.